ESO’s Very Large Telescope has taken a striking image of a beautiful yet peculiar pair of galaxies nicknamed The Eyes. The larger of these, NGC 4438, was once a spiral galaxy but has become badly deformed by collisions with other galaxies in the last few hundred million years. This picture is the first to come out of ESO’s Cosmic Gems programme, an initiative in which ESO has granted dedicated observing time for outreach purposes. 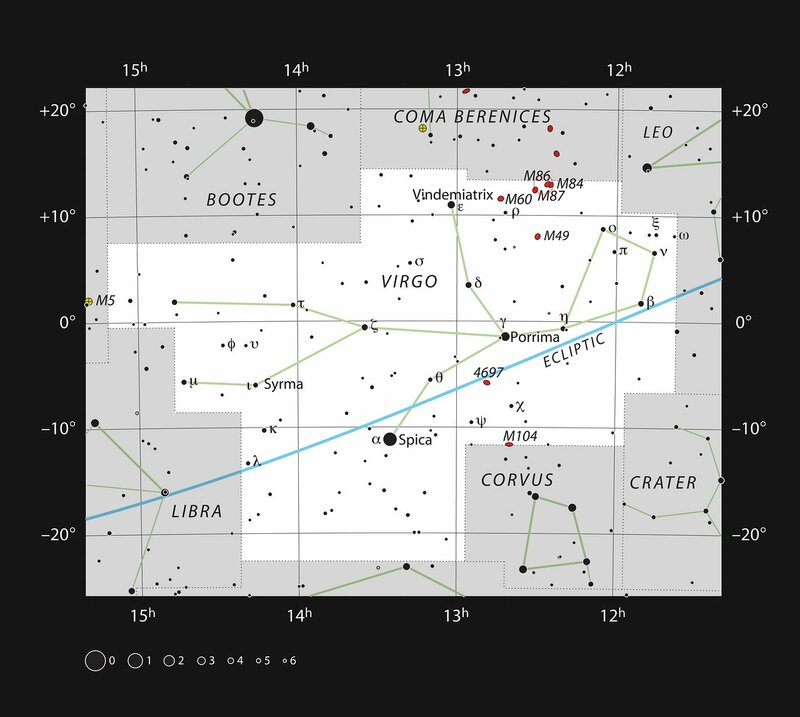 The Eyes are about 50 million light-years away in the constellation of Virgo (The Virgin) and are some 100 000 light-years apart. The nickname comes from the apparent similarity between the cores of this pair of galaxies — two white ovals that resemble a pair of eyes glowing in the dark when seen in a moderate-sized telescope. But although the centres of these two galaxies look similar, their outskirts could not be more different. The galaxy in the lower right, known as NGC 4435, is compact and seems to be almost devoid of gas and dust. In contrast, in the large galaxy in the upper left (NGC 4438) a lane of obscuring dust is visible just below its nucleus, young stars can be seen left of its centre, and gas extends at least up to the edges of the image. The contents of NGC 4438 have been stripped out by a violent process: a collision with another galaxy. This clash has distorted the galaxy’s spiral shape, much as could happen to the Milky Way when it collides with its neighbouring galaxy Andromeda in three or four billion years. NGC 4435 could be the culprit. Some astronomers believe that the damage caused to NGC 4438 resulted from an approach between the two galaxies to within about 16 000 light-years that happened some 100 million years ago. But while the larger galaxy was damaged, the smaller one was significantly more affected by the collision. 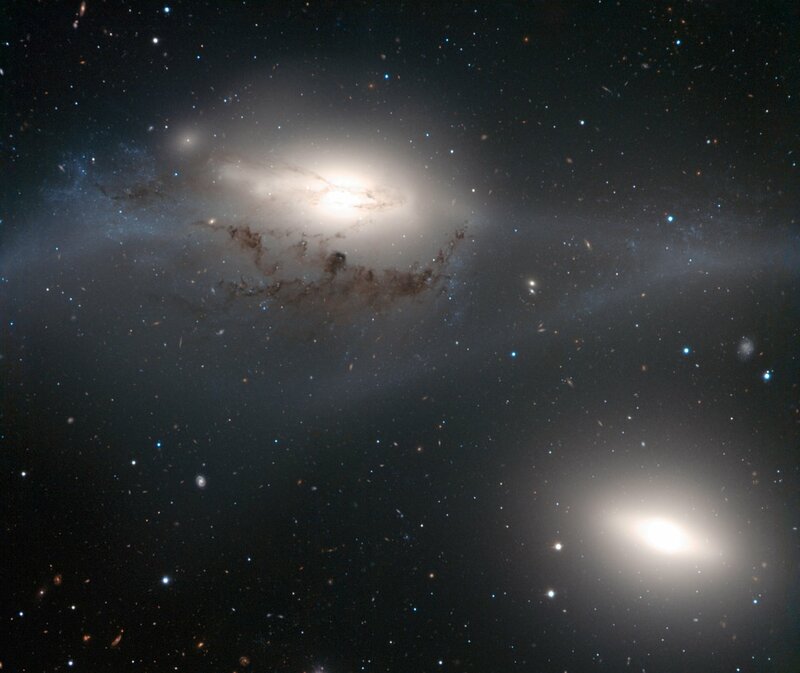 Gravitational tides from this clash are probably responsible for ripping away the contents of NGC 4438, and for reducing NGC 4435’s mass and removing most of its gas and dust. Another possibility is that the giant elliptical galaxy Messier 86, further away from The Eyes and not visible in this image, was responsible for the damage caused to NGC 4438. Recent observations have found filaments of ionised hydrogen gas connecting the two large galaxies, indicating that they may have collided in the past. The elliptical galaxy Messier 86 and The Eyes belong to the Virgo Cluster, a very rich grouping of galaxies. In such close quarters, galaxy collisions are fairly frequent, so perhaps NGC 4438 suffered from encounters with both NGC 4435 and Messier 86. This picture is the first to be produced as part of the ESO Cosmic Gems programme. This is a new initiative to produce astronomical images for educational and public outreach purposes. The programme mainly makes use of time when the sky conditions are not suitable for science observations to take pictures of interesting, intriguing or visually attractive objects. The data are also made available to professional astronomers through ESO’s science archive. In this case, although there were some clouds, the atmosphere was exceptionally stable, which allowed very sharp details to be revealed in this image taken using the VLT’s FORS2  instrument. Light passing through two different filters was used: red (coloured red) and green-yellow (coloured blue), and the exposure times were 1800 seconds and 1980 seconds, respectively. FORS2 is the visual and near ultraviolet FOcal Reducer and low dispersion Spectrograph for the VLT. It is installed on the VLT’s Unit Telescope 1.